Providing the best solution for you with code compliance and safety at the forefront because our kids, our family, and our community are in those seats. The best solution for your facility may not be the same as the school district down the road. For some, it’s more about the look and feel of the gymnasium and for others it’s more about functionality and ease of use. Truth is, capital improvement purchases such as seating can be extremely complicated, but they don’t have to be if you do your homework. Considering this is typically a once in a generation purchase, you want to approach it correctly, but where do you start? We’ve gotten a lot of questions and a lot feedback over the years as well as calls to update new seating because not all seating options were considered including the addition of team seating, scorer tables, or partial seating options. 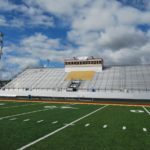 Last year, we sat down with Olmsted Falls to discuss their High School Bleacher Replacement project and you may be shocked to know that there were only 13 days (not business days, but days) between the date they contacted us and the day they supplied us with a Purchase Order. What made their decision that easy? Simple: They did their research. We talked with Timothy Atkinson about his process for choosing Farnham Equipment Company and Hussey Seating Company and found out just how they did their due diligence prior to making a selection. The district passed a Bond Levy in November 2016 for renovations to be completed in 2018. The district wanted to show the community they were progressing with the renovations by starting in the gymnasium, so rather than wait until 2018, they had their new bleachers installed prior to the start of the 2017-2018 school year. Mr. Atkinson shared with us that they got the parents involved on their research. Knowing that a board office member and her son spent numerous hours in gymnasiums across the state for wrestling meets, Atkinson asked her to take note of what she did and didn’t like about the bleachers she was spending countless hours on along with the manufacturer information. She involved other parents in the process and shared the information with the decision makers. That, coupled with the benefits of NJPA pricing, now Sourcewell, and quick response from FEC, helped them make their decision. Bottom Line: Know what you truly want and involve your community or colleagues in the process to create the ultimate wish list. Once you have your wish list, find out from the experts what is truly possible within your space including the addition of media platforms, team seating, and/or scorer tables. Even if these items aren’t feasible for you right now budget wise, you want to be able to add them down the road without having to modify your seating again. The majority of the bleachers we install include at least two of these in their layout if not all three and proper egress has to be considered. 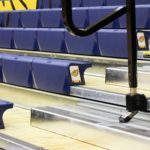 Read more about Egress & What it Has to do with Bleachers, Team Seating and Scorers’ Tables. We’ve Got Spirit How ‘Bout You? Hussey Seating Company has a Total Graphics Package that provides the ultimate fan experience from Xtreme Logos, StepSign Graphics, CourtSign Graphics, Safety End Closure Graphics, CourtSide Graphics, Colored Rails, Media Platform Graphics, and Team Seating. Many of these options are great for selling sponsorships to assist with your investment. You dream it up – we can make it happen. Easy Button. Quite literally if you upgrade to a wireless remote for your bleachers. Other ease of use options include Auto-Rotating Aisle Rails and Hinge Kits for Floor to First Row Aisle Steps. If you use your aisle steps now (you should – code compliance!) you know just how heavy the steps can be and that sometimes they wonder off to a closet somewhere… Additional accessories can be found here. VIP Access. Whether you want to highlight the student section or create a sponsored VIP area, you can upgrade your seats to include backrests, cup holders, and more. Color combinations are vast so you have options! Looking for more information or ready to purchase? Contact Pat Kindelin or David Fahrenholz – they’ve got you covered. Curious about why Hussey Seating Company is the industry leader when it comes to telescopic solutions? Check them out for yourself here. We’ve partnered with Hussey for over 40 years and stand by their product, so much so that we are one of their Hussey Advantage Regional Service Centers with our Maintenance Solutions program.